This is an applied math class, not an art class. If you turn in a model that has ambiguous geometry in your second and third tests, be prepared to repeat the course. 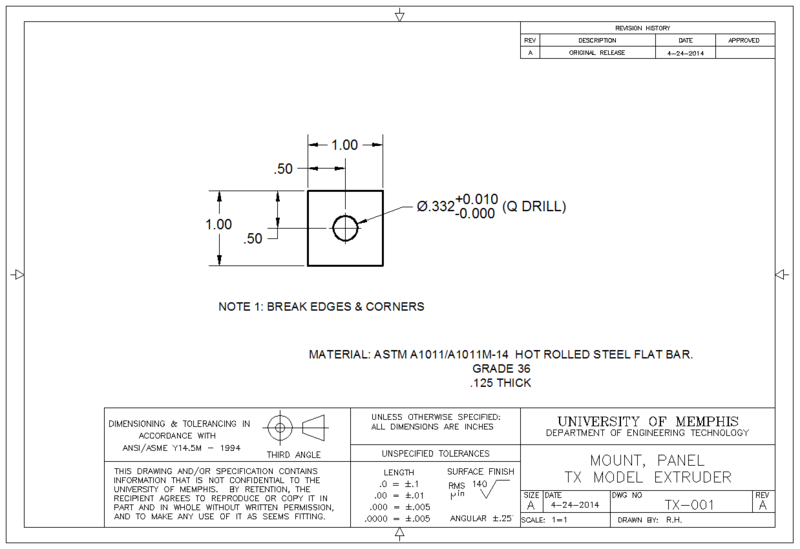 Create a 3D model of the panel mount. The drawing should be based on a fully constrained sketch of a square, and the hole should be constructed as a hole feature (not an extruded circle). Notes on design intent: The square shape may become rectangular in other configurations of this design, but the hole will always b centered. There will always be one hole. Your UUID is the name part of your email address. REMEMBER: You will NOT receive credit for any exercise in this class if the filename is not correct. You will find most of the answers to the first quiz here and on the syllabus. Quizzes require two unique numbers to ensure you get proper credit. The first is your individual course passkey. This number will be issued to you on the first day of class. It is NOT your U number. The other number (the “quiz access number”) reflects your attendance. You will receive a this number each time you initial in your attendance. If you are late, absent, or forget to initial in on the list you may still take the quiz, but you will only earn half credit for the quiz portion of the assignment. If you do not have a quiz access number, you can still take the quiz for half credit. Enter 99 as the quiz access number. If you us a number that does not have your initials on it you will receive a -10 for that assignment. You may not initial in for any other person. This will be treated as academic misconduct. You must enter your initials under the first available (lowest) quiz access number. You can’t just always use the number 17 because you like it. NOTE: There are quizzes for both homework and lab assignments. Homework assignments (CAD & Quiz) are always due at the beginning of the following class period. Labs (CAD & Quiz) are always due at the beginning of the LECTURE PERIOD following lab day.